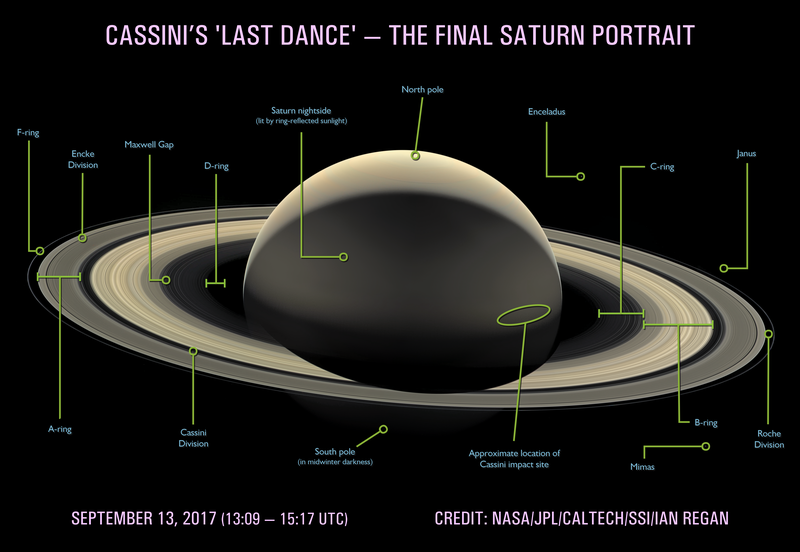 I didn’t think I’d be writing about the Cassini mission again, or at least not so soon after the spacecraft’s demise. Once the probe — which orbited Saturn for over 13 years — had plunged into the ringed planet’s atmosphere on September 15, I didn’t expect to hear anything new about it for a while. This magnificent mosaic is comprised of 75 separate images over three filters (plus one without a filter) using long and short exposures to capture fainter and brighter detail. Regan describes the entire process on his blog at The Planetary Society. He also provides an annotated version to help you spot different features; included are the north and south poles, the different ring groups, and the moons Enceladus (above and to the right of the planet), Janus (to the right), and Mimas (below and to the right). One thing that jumped out at me was the odd illumination pattern. The planet itself appears as a bright horizontal crescent, a view we literally cannot get from Earth. Saturn orbits far, far outside Earth’s orbit (about 9.5 times farther out), and so, from our orbit huddled close to the Sun, we can only see the daylit part of the planet, essentially as a full disk. But Cassini was on the other side of Saturn and well above the plane of the rings, so it saw the “top” (northernmost) part of the planet as a crescent lit by the distant Sun. But we see more than that in this image as well. The night side of Saturn is also faintly illuminated. The source of that light is the rings! Icy and shiny, they reflect the sunlight hitting them in all directions, softly lighting the dark part of the planet. If you were in a balloon, floating high above Saturn’s clouds at night, you’d see the rings stretched across the sky*, lighting up the cloudscape in the same way the full Moon does on Earth. But there’s even more: The ringlight appears to be stronger on the right and left sides of Saturn’s disk. And it is! Saturn’s shadow falls across the rings in the middle, so they don’t reflect as much sunlight there. The rings on either side of Saturn are brighter, and provide more illumination, making that pattern. Gazing upon this, I’m not sure which emotion is tugging at me harder: the sadness of knowing that Cassini is now molten and crushed, falling slowly down into Saturn’s interior, or the ethereal joy seeing that, once again, even posthumously, this mission has the capability to surprise and delight. I’m comfortable experiencing both. The Universe contains multitudes, but so do we, and we are capable of appreciating it on many of those levels simultaneously. I think this only helps us when we dare to explore: We understand the dangers and risks, but we are compelled to learn more, to find out, to discover, only because we want to know. Cassini was the best of all these drives, and a paean to what it means to be human in the cosmos. * Unless you had the misfortune of being right on Saturn’s equator, in which case the rings would be an eye-wateringly thin line slicing the sky in two; the rings are only a few meters thick and would look one-dimensional to your eye.